Almost every Internet broadcaster uses Skype to connect with guests for a show. Using Skype can be frustrating because it is a half-duplex service, meaning that only one person can talk at a time. If the host and the guest talk at the same time, the louder of the two is going to cause the other person’s audio to duck or decrease in volume. Ducking can be a real problem when the show is about a hot topic and the host and the caller are really motivated. It is also a problem if the host tries to play music or send telephone audio to the guest. There is a simple solution to prevent Skype from ducking calls. When you hear it, you’ll wonder why you didn’t think of it already. In professional broadcasting, the on-air talent almost always has return audio from the producer or the control room. Notice how the weather guy on your TV station has an ear piece so that he can receive his audio cues. That monitoring system is called IFB. The trick to eliminating Skype ducking is to put the host and the guest on two different channels. With this configuration, the guest and host audio streams are not competing with each other for whatever bandwidth Skype has to offer, and the audio flows smoothly in both directions. Now it doesn’t matter that Skype is half-duplex since you’re sending audio in only one direction on each channel. You can separate the host and guest audio by using two instances of Skype on the same computer, using the /secondary command line switch. If you think about it for a second, though, just like with the weatherman, the return audio from the host to the guest does not need to be full, wideband audio like Skype provides. If the guest is already bandwidth-challenged, this configuration will contribute to the problem. To minimize bandwidth, this setup takes advantage of a free technology call SIP. The SIP client of choice is Blink from http://icanblink.com. Clients are available for PC and Mac. If you choose to use two instances of Skype, you will have to adjust these instructions accordingly. 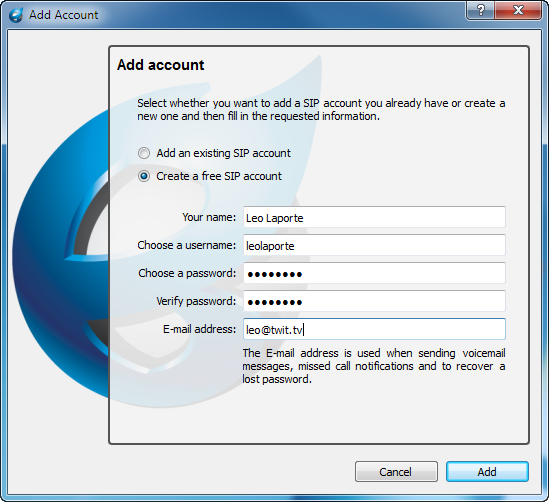 A SIP client needs a SIP account to connect through the network. Both the host and the guest need their own accounts. When you start Blink, it asks if you want to add an existing SIP account or create a free SIP account. Even if you already have a SIP account, follow the instructions on the screen and create a new one. Blink automatically configures itself to use that account, which will probably be <host>@sip2sip.info. Manually configuring a SIP account for the first time can be a bear! Once you and your guest have successfully installed Blink and created SIP accounts, play with the software a while to learn how it works and to make sure it is working correctly for you. Make a SIP-to-SIP call with your guest by “dialing” <guest>@sip2sip.info from your <host>@sip2sip.info account, substituting your actual account names for guest and host. If you’re not able to connect with each other and communicate, the rest of this tutorial will not be of much use. While you’re testing, make a Skype-to-Skype call with your guest to make sure that everything is working as it should. You must be able to communicate like normal. If there is a problem with Skype, you need to solve it before continuing with this setup. Assuming that Blink and Skype are working well, it is time to activate the full duplex configuration. There will be a lot of variations in computer systems, so you will have to make adjustments to these instructions to fit your system. On the host computer, in Skype, go to Tools | Options | Audio Settings. Write down the exact names of the drivers being used for Microphone and for Speakers. Pull down the Microphone arrow to see what other drivers are available. Is there a second soundcard? Is the motherboard soundcard available? What you need to select is a soundcard that does NOT have audio input. For example, if you’re using a USB soundcard for Skype and you’re not using the onboard soundcard, select the onboard soundcard as the Skype Microphone. It is imperative that whatever input you select, it cannot have audio on it. If it has audio, that audio will cause ducking in the Skype playback audio. If you don’t have another driver to select, consider grabbing a really cheap USB soundcard and plugging it into the computer. Select that soundcard for the Skype Microphone. No cables are connected to the USB soundcard. The Skype Speakers have to be connected to a valid output, which is the soundcard that feeds Skype audio to your mixer. 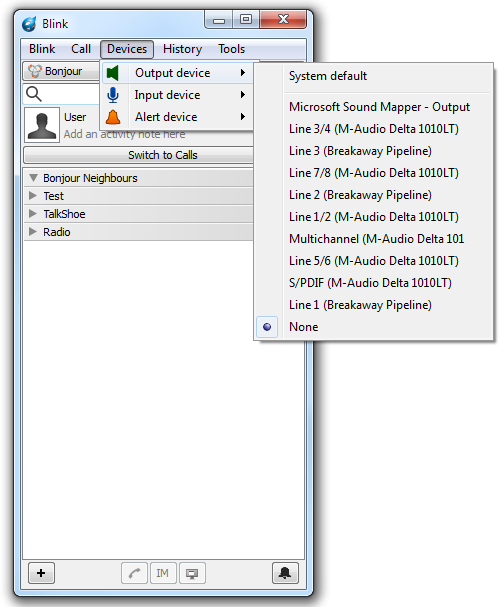 If you’re using a USB soundcard for Skype, the Speakers should select that USB soundcard. When you press the green triangle test button beside the selector window, you should hear the Skype ringing signal through your mixer. If you don’t hear it, correct the problem before continuing. Since Skype was working before you started this setup, you hopefully didn’t have to change the Speakers setting. In Blink, click on Devices. Move the mouse over Output device. A menu will pop up to let you select the output device. In this case, we don’t care about Blink audio sent by the guest to the host. Select None. Remember, we’re going to listen to the guest’s audio on Skype – not Blink. If you have a cheap USB soundcard as above with no cables connected to it, select that soundcard. Move your mouse to the Input device selector. Here, choose the soundcard that you wrote down previously. This selection has to be a real soundcard input so that your mix-minus feed from the mixer will send audio to the guest through the SIP connection. Note that it may be possible to create this configuration on your computer with a single soundcard. In Skype, leave the Microphone selection as you found it, ensure that “Automatically adjust microphone settings” is not checked. Move the blue ball slider all the way to the left to turn off the audio input to Skype. There are two reasons that this option may not work on some computers. First, your computer may not like sharing the Skype Microphone driver with the Blink Input device. Second, some soundcard drivers do not allow you to adjust the Skype Microphone level, so you will not be able to set it to off. The level adjustment slider may be grayed out. If your computer doesn’t mind sharing the driver, and if you are able to change the Skype Microphone level, this method should work. The setup for the guest is the mirror image of this setup. Follow the instructions above, but the Skype Microphone on the guest computer needs to be the actual soundcard that is connected to the mixer. The Skype Speakers need to be an unused soundcard (unless you follow the note above about sharing a driver.) The Blink Output device is the real soundcard to send audio to the guest’s headphones. The Blink Input device should be set to None. Remember, guest audio is being sent to the host on Skype – not Blink. If the guest is using a mixer, the audio feed to Skype must be a mix-minus feed that excludes the Blink return audio. If it isn’t, there will be an echo. There are several characteristics of this system of which you need to be aware. First, the host and the guest absolutely must wear headphones. There is no echo cancellation. The speakers must be off. Skype and SIP both have latency. The echo will be horrible. Second, you may want to consider having the guest install TeamViewer to allow you to log into his computer and do the setup for him. The setup is too hard to explain to someone in a hurry. 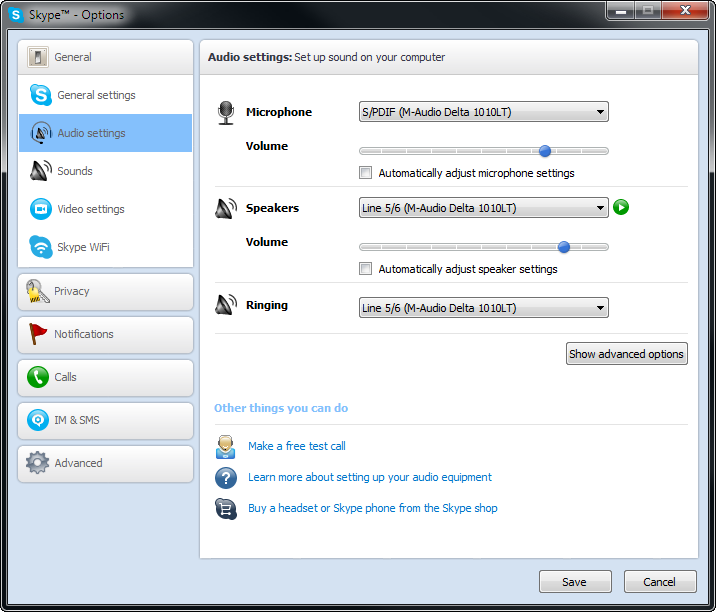 Third, if you change the audio sources while Skype or Blink is active, the sources may not actually change. If you don’t hear audio right away, close and reopen each program. Here’s an example of a working system. In fact, this system is used for Rick’s House Radio Show every Saturday morning from 8 until 10 AM Eastern at http://mixlr.com/rickshouse. If you go to http://mixlr.com/rickshouse/showreel and select the show from January 26, 2013, you will hear Rick , the host, easily talk over the music without any audio ducking problems. The host setup is in North Carolina. Rick is at his home in Florida using an Audio-Technica AT2005USB microphone to send audio over Skype while listening to return audio with Blink through his laptop’s onboard soundcard. (He could use the soundcard built into the AT2005. It really doesn’t matter.) The show is streamed over Mixlr to a radio station in Tennessee. You get to hear the raw feed, warts and all. Once you have two-way communications established between a host and a guest computer, both of you count to ten at the same time. Neither audio will affect the level of the other. Your Skype/Blink system is now full duplex. If you prefer to create the system with two Skype accounts, go ahead. Start a second instance of Skype using the “/secondary” command line switch, and substitute “Skype Secondary” for “Blink” above. Skype doesn’t have the option to select “None” for a Microphone or Speaker, so you may have the issues with driver sharing above. If you do, use the cheap USB soundcard trick. The primary disadvantages of using two Skype instances are increased bandwidth usage, confusion, and Skype itself. SIP connections seem to be more reliable. If you try this system, post back here, and let us know how it works for you. If you can’t get it to work, make sure that you can make Skype-to-Skype and Blink-to-Blink calls with the proper audio sources set. If all else fails, you can contact me, and I’ll try to help. Excellent article, Mike. Looking forward to trying this. I’ll be RT’ing. This is a really complex solution. You could alternatively use Google+ Hangouts (for free) and bring in 9 other people. No audio ducking or issues. Solved. I have recently started exploring TeamSpeak as and option. It is low latency and full duplex. It does require you to have a server but this is not too hard to set up. The clients are available cross platform so it has a big thumbs up from me. It is perfect for the return audio though. No video support yet. Mike, great article. Thanks for sharing! If you try this setup, let us know how well it works for you. As I mentioned in the article, we use it for Rick’s House (terrestrial) radio show each Saturday. Since we now publish the audio from the shows without music - for licensing reasons - you don’t hear the benefit of him talking over the music, but the benefits are obvious when Rick and I speak at the same time. If you want to interact with me or need some help with this technique, follow me on Twitter at @mcphillips. I use Skype for interviewing during broadcasting and I don’t experience these issues. This is because I use an external soundcard (Creative X-fi Go). Their What U Hear feature manages any thing that the soundcard picks up and allows it to be broadcasted through my Shoutcast server. KSON and DeWayne, the problem is not related to computers or sound cards - it’s a Skype issue. If you’re conducting two-way conversations on Skype, you’re experiencing the ducking issue since Skype is half-duplex. If the problem is not bad enough for you to notice, that’s great. Some people hear the problem better than others. For those of us whose setups are affected, this solution is a great resource. Please note that I am not notified when comments are made. If you have a question, please contact me on Twitter at @mcphillips. If you’re not a Twitter user, try my Gmail account, which is mcphillips.